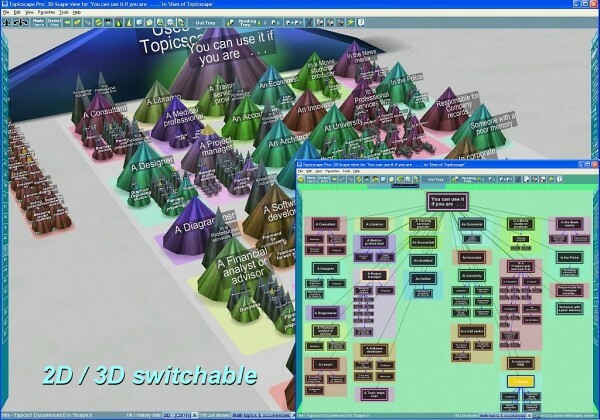 3D Topicscape Pro uses the concept-mapping or mindmapping approach to allow ideas and information to be organized, but as well as the usual 2D sheet, it works in 3D. This sparks creativity and innovation by providing a tool to capture ideas - as they flow - in an unlimited 3D mindmapping landscape or 2D Map. (Comparison: Lite vs. Pro versions http://www.topicscape.com/Pro-features.php ). This is the information organizer for mindmappers. Visual thinkers now have a new way of managing projects, computer files and web pages. Concept mapping and mindmapping are powerful tools in business. But a major challenge for business users of mindmaps or concept maps comes when the practical limits of a flat sheet are reached. This happens on any large project, yet that is the time when you most need the ability to scan the information landscape. 3D Topicscape overcomes this by allowing unlimited levels of hierarchy. It provides zooming, and flight through the information landscape. And if you use mindmapping software to organize and store files, you will appreciate Topicscape's ability to store multiple files at any node (topic). Users can find their information using the instant word search, but the right keyword or phrase doesn't always come to mind. Then, Topicscape's powerful concept searching comes into play: By flying and zooming in the 3D landscape, and digging down (or up) to different levels, success is much more likely. And a topic is allowed to appear in more than one place. Each will be just another instance of the same topic - change one and they all change. Topicscape is a valuable addition to the toolbox of project managers, researchers, legal professionals, consultants, medical professionals and anyone struggling with information overload. There is an example of how one user learned its value at http://www.topicscape.com/user-story/project-management.html. Other user stories there show how it has been used for business, projects and hobbies. This site does not contain serial number, crack, keygen 3D Topicscape Pro serial number : serial number is the simplest type of crack. A serial number(cdkey,product key,etc) is register the program as you may already know. a crack or keygen may contain harmful software. If you cannot find the exact version you want, just give it a try. for more information read .nfo/.txt/.diz file include in zipped file.